Beverly's Official Blog | News and findings from world of crafts, scrapbooking and more: Big Shot Demo at Monterey Tomorrow! Don't forget..... come by Beverly's in Monterey for a Big Shot demo tomorrow, November 6th from 6pm - 7:30pm. 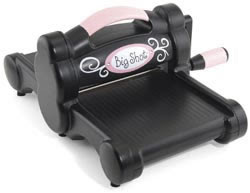 The stylish black and pink Big Shot works with the entire Sizzix product library, from the biggest to the smallest dies. It cuts cardstock to fabric and many things in between. Can't make the demo? Watch our "how-to" video here.